Coincidence is a lazy way out of or into fictional situations. An ex-lover comes back into town after the main character is married and pregnant? A character loses their job only to have an opportunity to go on a vacation? Do you use coincidence to fix your plotting problems? Creating artificial motivation is transparent and a superficial fix. Coincidence looks like thin plotting and lack of imagination to readers. Coincidence is obvious which makes readers feel that they are being played for fools. Readers will feel that the writer thought they could get away with coincidence instead of plotting more intricately or with more motivation/reason for character actions. Readers will lose loyalty to the character and author as you’ve lost readers’ investment in the outcome of the novel. Motivation. Why do characters do the things they do? POV. Whose head are we in? An ex-lover can come back into town after the main character is married and pregnant because their mother is ill. A character can lose their job only to travel if it is a friend they’ve been meaning to visit but have been working so hard they haven’t had time. Whose POV are we in and how can you communicate motivation for all your characters through this writerly choice? Narrative techniques come into play here. With first person you can’t get into the heads of other characters, only hearsay, which is why it is important to be careful not to rely on coincidence when you are trying to be mysterious. Tip: Turn coincidence into serendipity! 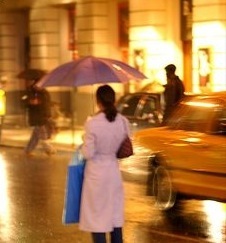 Instead of a situation where your protagonist is hailing a cab in the rain after a bad day only to be sorrowfully ousted by a good-looking gentlemen why not have alternating POV where we know what happened in his day and why he needed the cab more (sister is having her baby and he needs to get to the hospital). Is he a misogynistic jerk or a devoutly loyal brother? Narrative technique is one way to leave readers feeling invested in character outcomes leads to serendipity instead of one-sided coincidence and lack of belief. Think Something Blue vs. One Day. Knowing what motivates all characters, not just your protagonist, is the key to rich, meaningful and well paced plot events that readers believe in, get lost in, and get invested in the outcome. A trust factor builds loyal readers. Write What You Know or Stretch Your Imagination? Thanks, Carly! As a writer with only two novels under her belt (unpubbed) I found this post to be very helpful. I’ll keep it in the back of my mind as I work on my story. Thanks, it’s something to keep in the back of your mind. It isn’t a problem for everyone, but a reminder that when those coincidental plot thoughts do come up to squash them!